Russian Lawmakers Move To Ban Troops From Using Social Media And Smartphones Russian lawmakers have passed a bill restricting social media and smartphone use by service members. 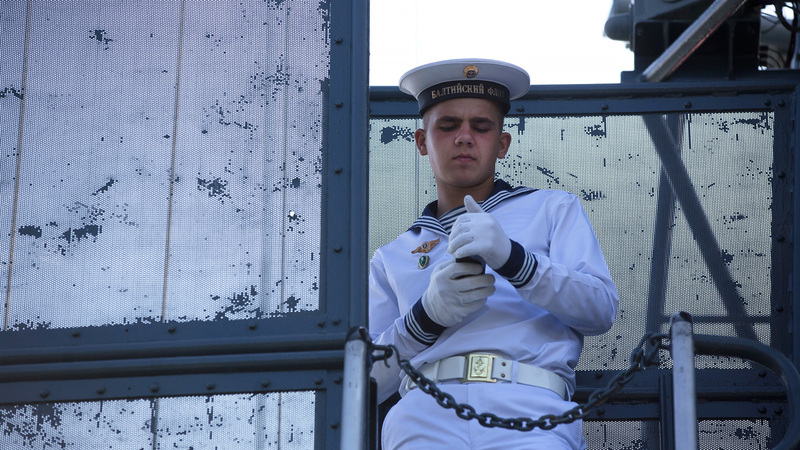 A Russian sailor checks his smartphone aboard a warship while supervising visitors during Russian Navy day at the Vistula lagoon in Baltiysk, Russia, in 2016. On Tuesday, Russian lawmakers passed a bill restricting service members from using smartphones. In an age of information warfare, Russia is going back to basics in a bid to protect its secret information from prying eyes, by telling troops to step away from their smartphones and social media. On Tuesday, Russia's lower house of parliament passed a bill banning military personnel from posting about themselves or colleagues online. The measure also restricts the general use of smartphones. The State Duma adopted the final reading of the draft law that bans military personnel from posting about themselves or colleagues online, the use of devices that can distribute audio, photo, video and geolocation data via the Internet is also restricted for them. Russia's upper house must approve the bill before it is signed into law by President Vladimir Putin. Russian newspaper Kommersant reports that is expected to happen by next month. Online trails left by troops have undercut the Kremlin's stance on several issues, including the claim that Russian troops were not fighting in eastern Ukraine, as well as the extent of Russia's role in Syria, reports The New York Times. Russia has officially denied any role in the 2014 downing of a Malaysia Airlines passenger plane in Ukraine that killed nearly 300 people aboard. But digital sleuths from the investigative group Bellingcat undercut the Kremlin's line by finding online photographs of a Russian anti-aircraft missile launcher used in the attack. "We discovered quite quickly that the soldiers there were using a lot of social media, posting photographs of each other, posting photographs of the base," Eliot Higgins, co-founder of Bellingcat, told NPR in 2016. Deputy Defense Minister Nikolai Pankov attached a note to the bill passed on Tuesday, explaining why Russia needs the measure. "Information, shared by soldiers on the internet or mass media, is used for informational and [psychological] pressure and in separate cases to form a biased assessment of Russia's state policy," said the note, according to a translation by the Times. The ban would include tablets and laptops, but phones of more basic models would be exempt, reports the BBC. In the U.S., service members are allowed to use social media, provided they adhere to guidelines. The Army advises soldiers to: "Think about the message being communicated and who could potentially view it." But sometimes a digital footprint can be left inadvertently. Last year, the BBC reported a fitness tracking app called Strava published the exercise routes of service members, revealing the outlines of military bases.